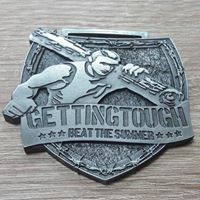 Getting Tough Race GETTINGTOUGH - THE RACE is the toughest extreme obstacle race in Europe. The running distance is real 24KM and about 900HM. In addition to numerous obstacles on the track, special obstacle course must be overcome. These include u.a. Electric carving Stormway, Signal Iduna Experience, and the dreaded Walk of Fame. The length of the race is limited to 24 KM! There are designated food stations on the short and long haul. Cost per vehicle: 5.00 € please prepare appropriately. Please see our obstacle course race discount & promotion page for all the latest discounts, promos, promotions, discount codes, and coupon codes for Rudolstadt Germany Getting Tough The Race 2018. There also may be one listed at the top of this page.